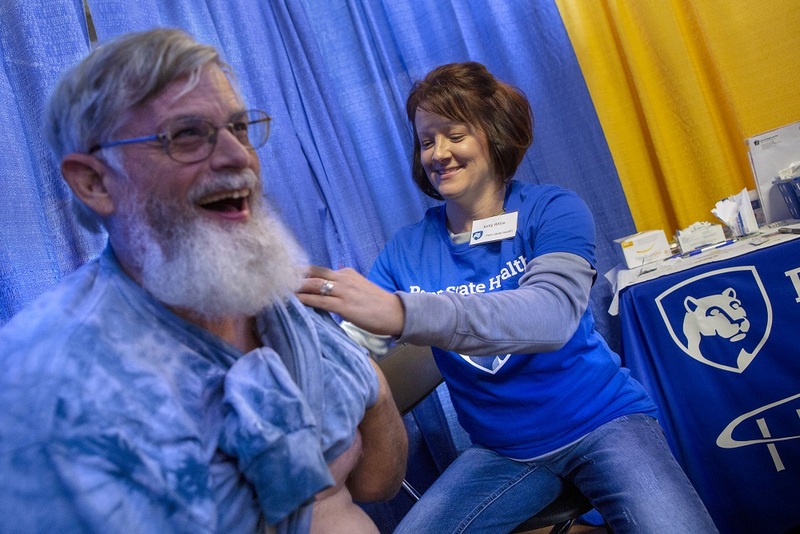 Todd Miller, left, from Finksburg, Md., jokes with Kelly Rittle, a registered nurse with Penn State Health Milton S. Hershey Medical Center, who gives him a free flu shot at the 2019 Pennsylvania Farm Show. Todd Miller saw the sign from a distance over the tops of vendor tents, streams of people and cages containing live poultry. “Free Flu Shots,” it proclaimed. Miller hadn’t come to the Pennsylvania Farm Show all the way from Finksburg, Md., on Jan. 9 in search of an inoculation against influenza, but he’d been planning to get one anyway. Miller, who works for the Peace Corps in Washington, D.C., was one of thousands of government employees temporarily out of work because of the partial government shutdown. He’d driven north to the show to catch up with a few friends who, like him, raise alpacas. Moments later, he sat in a tent and peeled off his shirt to expose his left arm to Kelly Rittle, a staff nurse at Penn State Health Milton S. Hershey Medical Center’s Heart and Vascular Institute. 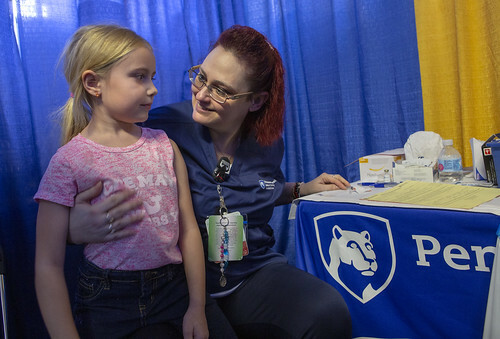 And in a matter of seconds, Miller became one of the 1,439 patients to receive a flu shot from Penn State Health and the Pennsylvania Department of Health this year’s state health fair. That’s up from 1,242 last year. Penn State Health has participated for the past seven years , and the record was 3,739 flu shots in 2013. Roughly 80,000 people died of the flu and 959,000 were hospitalized during the 2017-2018 flu season, the worst year in decades, according to the Centers for Disease Control and Prevention. While health officials herald the mass flu shots as an effective measure toward halting the potentially deadly virus, the annual flu shot effort creates a surreal scene. To the left of the of the Free Flu Shot area in the main hall of the Pennsylvania Farm Show Complex and Arena, a chef from Kitchen Craft Original Cookware demonstrated pots and pans. To the right, Superior Sleep mattresses were sold. Across the narrow corridor, Randy Meckley of Lancaster County offered handmade brooms. Even if they’re generally okay with getting a shot, most people are at least a little wary of a syringe. “Everybody is,” said Nichola Topolnicki, an operating room staff nurse at the Milton S. Hershey Medical Center. After they filled out release forms, nurses like Topolnicki spent about five minutes with each patient, enough time for a little small talk, a little flu talk… “This might hurt a little” … and then the patient is off. Sebastian Steckler, 5, of Biglerville was scared, but Topolnicki hugged him and held him on her lap. Within seconds, he’d gotten his shot and was posing in the toy superhero cape the inoculation team gave him for his trouble. His mom, Deb Steckler, wasn’t lured by the sign. She has been getting her flu shot from Penn State Health and Department of Health volunteers at the Farm Show for the past three years. “I don’t have to schedule a doctor’s appointment,” Steckler said. Other patients said they favored the tent because they didn’t have health insurance. When Miller saw the towering Flu Shot sign, it rang a bell. Before the government shutdown closed his office, he’d signed up to get a shot.